At this time of year we receive many inquiries about winter laminitis. But “winter” laminitis is a misnomer because laminitis never comes on overnight. 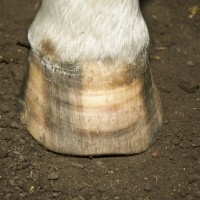 All laminitis cases are in the developmental stage for man weeks before they actually get sore. And even though our winter horses are not on sugar-rich grass I still see many of the same problems as horses with summer pasture laminitis: unbalanced hooves and/or poor trimming practices, high sugar feed such as grain or commercial feeds, high sugar hay, weight gain, insulin resistance and/or leaky gut. Insulin resistance and leaky gut – especially when accompanied by poor hoof confirmation are the most common causes of laminitis, no matter what the season is. If you’re dealing with laminitis, you should know the do’s and don’ts of caring for a laminitic horse.